Watford and Southampton served up an uninspiring draw as they both remain without a league win after three games of the top-flight season. Hornets midfielder Etienne Capoue had the best chance of the game only to head over from two yards. Ikechi Anya also sent in a dangerous cross for Watford striker Odion Ighalo but he failed to connect. 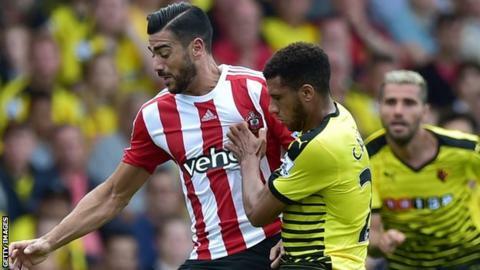 Graziano Pelle had a rare Saints chance but his angled shot was tipped over the bar by goalkeeper Heurelho Gomes. To say this was not a classic would be a bit of an understatement as both sides lacked a goal threat and cancelled each other out. Southampton drew 1-1 in the first leg of a Europa League qualifier at home to Danish side FC Midtjylland on Thursday and lacked an attacking spark, especially after forward Sadio Mane went off injured early on. Following this performance, Saints manager Ronald Koeman may be concerned at the impact of combining the demands of a domestic season with a European campaign if they qualify for the group phase of the Europa League. On the plus side, Koeman employed a formation using three centre-backs and his side kept their first clean sheet in nine Premier League games. The Hornets scored 91 goals in the Championship last season as they achieved promotion but have yet to get off the mark in two home games this campaign. Chances were at a premium in this game and when they did come the home side's way they lacked the ruthlessness to take them. Anya twice delivered threatening crosses into the Southampton six-yard box in the first half and the first evaded everyone while the second went through the legs of Ighalo at the far post. "We tried to win but it was impossible. They changed their plan and it was difficult. "We had maybe two or three chances. It was difficult to create opportunities because they played well and defended with five players." "We played a little bit different than the first two games because we had to be defensively better. In my opinion, it always starts at the back and at least we had our first clean sheet of the season. "One of the key points of last season was that we had a strong defensive organisation." Southampton's Sadio Mane and Victor Wanyama have been linked with moves to Manchester United and Tottenham respectively but Koeman added: "We know have to deal with speculation over our players. "Again, no-one is for sale. Everyone stays at Southampton. We want to bring in another defender." Watford failed to have a shot on target in this match, with all 13 of their efforts being blocked or off target. Troy Deeney has only scored two goals in his last 11 appearances for Watford. The Saints have won just one of their last nine Premier League games (won one, drew three, lost five), but this was their first clean sheet in that run. Watford will travel to Preston on Tuesday for a League Cup second-round match. Southampton face a trip to Denmark to play FC Midtjylland in the second leg of their Europa League qualifier on Thursday with the tie poised at 1-1. Match ends, Watford 0, Southampton 0. Second Half ends, Watford 0, Southampton 0. Attempt saved. Steven Caulker (Southampton) header from the centre of the box is saved in the bottom left corner. Assisted by James Ward-Prowse with a cross. Attempt missed. Ben Watson (Watford) right footed shot from outside the box is high and wide to the right following a set piece situation. Alessandro Diamanti (Watford) wins a free kick on the left wing. Substitution, Watford. Ben Watson replaces Valon Behrami. Attempt missed. Shane Long (Southampton) right footed shot from outside the box is high and wide to the right. Assisted by Cédric Soares. Attempt missed. Victor Wanyama (Southampton) left footed shot from outside the box is high and wide to the left. Attempt missed. Shane Long (Southampton) right footed shot from long range on the left misses to the left. Attempt missed. Odion Ighalo (Watford) header from the centre of the box misses to the left. Assisted by Jurado with a cross. Attempt missed. Jay Rodriguez (Southampton) header from the centre of the box is close, but misses to the left. Assisted by Cédric Soares with a cross. Substitution, Southampton. Jay Rodriguez replaces Graziano Pellè. Offside, Watford. Craig Cathcart tries a through ball, but Troy Deeney is caught offside. Corner, Watford. Conceded by Steven Caulker. Attempt missed. Graziano Pellè (Southampton) left footed shot from the centre of the box is high and wide to the left. Assisted by Jose Fonte following a set piece situation. Steven Caulker (Southampton) wins a free kick in the defensive half. Attempt missed. Cédric Soares (Southampton) right footed shot from outside the box is just a bit too high. Assisted by Graziano Pellè. Offside, Watford. Craig Cathcart tries a through ball, but Jurado is caught offside. Attempt saved. Victor Wanyama (Southampton) right footed shot from outside the box is saved in the bottom right corner. Assisted by Shane Long. Nyom (Watford) wins a free kick in the defensive half. Attempt missed. Alessandro Diamanti (Watford) left footed shot from outside the box is high and wide to the left. Assisted by Etienne Capoue. Attempt missed. Etienne Capoue (Watford) header from very close range is just a bit too high following a corner. Attempt blocked. Troy Deeney (Watford) header from very close range is blocked. Assisted by Alessandro Diamanti with a cross. Corner, Watford. Conceded by Matt Targett. Jurado (Watford) wins a free kick in the defensive half.